Jess Lee takes amazing wildlife photographs around the world. On his website www.jessleephotos.com, you can see images of animals from Africa to Alaska and beyond. On his home turf in Idaho at the edge of the Greater Yellowstone Ecosystem, Jess Lee is a master. 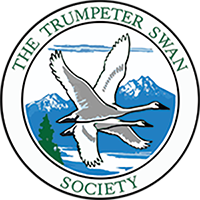 Trumpeter Swans are one of his favorite subjects. Jess is alarmed by the swift and serious decline in Yellowstone's breeding Trumpeter population. He notes that year after year pairs he's photographed over many seasons either have no cygnets or are gone. Vacant territories haunt him in places where he once spent hours quietly waiting to capture the essence of Trumpeters. He sees "the whole thing tanking." Jess Lee wants to help and we at TTSS are grateful for his concern and generosity. Jess has made one of his finest shots available to TTSS as a LIMITED EDITION PRINT. There will be 300 signed and numbered copies for us to offer to members and fans. We urge you to treat yourself to hours of staring at this beautiful image of a Trumpeter against blue ice. 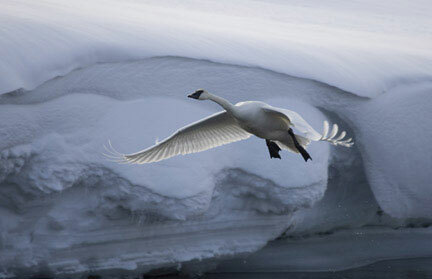 Winter is a time of challenge and this photo is testimony to Trumpeter tenacity. This print will make a great holiday gift as well, a wonderful way to give a beautiful gift, while putting your dollars to work to benefit the swans.